A 15-year-old boy stabbed to death in south London has been named locally as Jermaine Goupall. He is the 15th teenager to be killed in a knife attack in the capital this year and the second in less than 24 hours. There were 12 fatal stabbings in 2016. Jermaine was found by police officers at about 23:00 BST on Tuesday in Georgia Road, Thornton Heath, Croydon. He was confirmed dead at the scene shortly before midnight. There have been no arrests. An elderly neighbour, who knew the boy, said: "He was a nice lad, I would see him to speak to in the street and he would come over and stroke my dog, say hello. "I know his dad, Stan, better. It seems desperately sad that this can happen to such an innocent boy." Another neighbour said: "I was in my house and I heard a police helicopter at around midnight. "I've seen on the news that it was a 15-year-old boy; it's just so sad." Jermaine has not yet been formally identified by police. Post-mortem tests will take place later this week. Officers remain at the scene and cordons are in place. 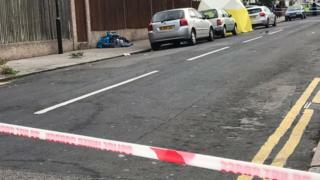 Councillor Alison Butler, deputy leader of Croydon Council, said: "I am devastated to hear another young man has lost his life to knife crime, and my thoughts are with the victim's family. "This is happening all too frequently both in Croydon and across London - enough is enough."